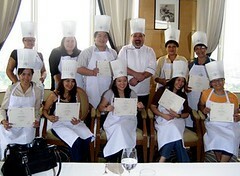 The class was headed by Chef Jean-Pierre Migne, Executive chef of Restaurant Le Bellevue. I have to admit that for the first few minutes at the start of the class, I can hardly concentrate on the lesson because his accent was so…French. Yes, certainly one of those moments when I was mentally kicking myself for not getting my digital camera repaired sooner. The recipes in this class were indeed simple and can be done in your kitchen. It featured ingredients that is practically synonymous to French cuisine: cheese and wine. There were two appetisers: Gratinated Oysters and Mussels with Mushrooms and Garlic-Herb Butter and Fried Camembert and Crabmeat in Pocket-Phyllo paste and Mesclun Salad with Dressing. Our main course was Pan-fried Chicken Breast stuffed with Cured Ham and Emmenthal Cheese, and Pont Neuf Potato (he used Gruyere instead, one of my favorite cheeses), and for dessert, Flambeed Strawberries with Green Peppercorns and Basil with Vanilla Ice Cream. It was Chef and his assistant who did all the cooking. It was a shame, because I was hoping it’d be more hands-on. He did however, gave us cooking tips like simmering instead of boiling, coving the pan when cooking to seal in flavor and using scissors to slice basil, instead of chopping it with a knife on a chopping board. After he finish each dish, samples of the finished product were given to each table. After the class, we were invited to the 27th floor, to his restaurant to sample the same recipes, albeit cooked in a professional kitchen. Restaurant Le Bellevue has the best view of Manila bay, and it’s fitting to have this gorgeous backdrop as we savor the French dishes they served. All I can say is that everything was perfect. My favorites were the vinaigrette for the Mesclun salad, which has vinegar, apple juice and calamansi, and the pan fried chicken breast. The pastry chef gave us a couple of “freebies” when they served the flambeed strawberries: cream filled pastries that was just absolutely perfect. 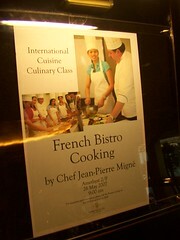 Though I wasn’t able to at least try cooking the dishes, I would definitely attend if they have a part two of the French Bistro cooking. 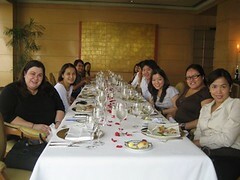 I hear that there’s a couple more cooking classes coming up at the Diamond Hotel: Japanese and Thai/Vietnamese cooking. Hmm, which should I attend next? Big thanks to Christine for the photos. Read Marielli’s entry about this here. Ajay has also written about it in her blog. I’m a friend of Marielle’s I’ve also read about this in her blog! That’s so nice! It was really such a pleasant surprise to see you there, Nina! Made the session even more enjoyable.